I love the optimism that comes from a new year and starting things off fresh. Like many families, we gathered friends and neighbors at our home for New Year’s Eve and inevitably the conversation turned to making resolutions. Gym memberships, diets, life goals were all on the list. But it was only the adults that were making goals. What about the kids? Were they just too busy playing FortNite or watching YouTube? Or maybe they just did not know what a New Year’s Resolution was, let alone how to stick to one. So to help me talk with my kids, I came up with some clear, actionable goals to help them grow into healthy young adults (and HINT HINT how they’ve already done these things at CAMP). Try one as a conversations starter tonight. Suggest your child replace one thing in their lunch with a healthier option. 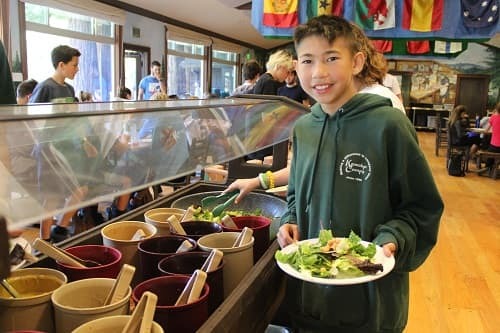 Help them brainstorm by asking about the camp salad bar. You can also suggest they replace soda or juice with water from their camp water bottle. Remind them how healthy they ate at camp (think Veggie Chop and Foil Stew). Set reasonable bed times. Remind them of the morning (7:15am) and evening bell (9pm) at camp where they got a full 10 hours every night. And how critical that time is for teen brain growth (especially right before a big test!). Create a space for electronics to be charged outside the bedroom and consider buying Circle or something like it to manage internet access at home. Set a goal of reading quietly for 30 minutes before bedtime. Keep a reading chart to reward progress. Schedule one tech-free 24 hour day per month. Put your camp counselor hat on and make a detailed plan for a day full of early morning reading, long walk, outdoor excursion, family prepared meal, and board game marathon. Remind them of the freedom they experienced when without their precious devices at camp. Surely they can last one day without screens at home! Start a new tradition with a family walk on the weekend to set good habits together. Start a Friday dance party or work in a bike ride with a local errand. Kids may drag their feet at home but we saw them charging around all day after day. Make a list of simple chores and let your child pick one to do for the month – setting the table, sweeping, taking out the trash. Remind them of the “work wheel” at camp and how everyone pitched in and took turns so the load wasn’t just on one or two people. Along the way they demonstrate responsibility and you get a little help! Ask your child about a skill they wish they had like playing music, cooking, shooting with a Steph Curry 3-point range and make a small attainable goal. This could be tied to an activity they are already doing or if they’re schedule is open provide an opportunity to look for a new beginning. Think of it like “Change Day” at camp when you’re ready to mix it up a little. Promise each other to use proper table manners (have some fun and adopt Andrew’s English accent). Set a goal to let someone else go ahead of you at the ball line check out, drinking fountain, or at the grocery store. Camp kids learn to think of the needs of their cabin group and they can do the same with their classmates or family.